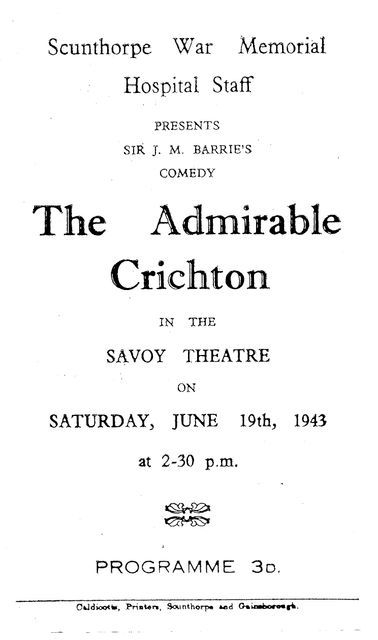 'The Admirable Crichton' entailed a great deal of work during rehearsals - especially trying to get all the cast together - but eventually the great day dawned and the dress rehearsal was held the previous Sunday afternoon at the Savoy Theatre. At that time the theatre was 'live' and it meant that large props could not be taken there until the day of the show. Like all dress rehearsals there was a state of chaos, followed by a week of apprehension until the show was presented the following Saturday afternoon. Only one performance was given (to a reasonably good sized audience) so many of the props had to be moved in the theatre on Saturday morning and out again after the performance so as not to interfere with the normal shows. All in all it was a happy and, I recollect, a satisfactory performance but little did I dream that this would prove to be the birth of a Society that has gone from strength to strength over the years. 'The Admirable Crichton' was a most ambitious project at a time when it was almost impossible to find materials for scenery or costumes - difficult even to provide ourselves, on coupons, with everyday clothing. Crichton, a true Desert Island castaway, made his own costume from sacks. We did have the benefit of the large stage and lighting of the Savoy Theatre, albeit for a Saturday afternoon only. However it had no scenery we could use and our doors and windows were propped up against black curtains. Cut-outs of rock formations proved hazardous, if hilarious, from the audience's view-point. Despite its faults the production proved a success, perhaps because it was for charity [to raise money for the Hospital, dependent at that time on voluntary contributions], but also perhaps because it filled a gap in what was for many people a life made up mainly of work. We provided an opportunity to see a live play.